This post was written in March 2017 and updated in April 2018. It’s taken me eight months of living here, but I finally made it to Xochimilco Mexico City. Xochimilco is the Venice of Mexico. A huge network of canals, it’s one of the most naturally beautiful places I’ve been to in this part of the country. It’s also a peek back at the former glory of Mexico City. Before the Spanish arrived, much of Mexico City was made up of canals. It was filled in by the colonists, and Xochimilco is all that remains as a reminder. It’s also one seriously awesome party. Xochimilco is where Mexico City dwellers head on the weekends to unwind, have a few beers, dance on a boat with their pals, and eat tons of delicious street food. As a first time visitor to Xochimilco, it’s important to know what the deal is. It’s a massive tourist trap and you don’t want to end up paying through the nose only to hang out in an empty canal. Getting to Xochimilco from Mexico City is SUPER simple. Take the metro to Tasqueña. It’s the end of the blue line (line 2). From that same station follow the signs for the Tren Ligero – the train line that will take you straight to Xochimilco. It’s the last stop on that line. NOTE: as of March 21, 2017 – the train line was under construction. Currently, from Tasqueña, you will take a FREE bus to Azteca Stadium where you can then get the train to Xochimilco. It’s all well signposted and the train is only 3 pesos! Once you get to the station in Xochimilco you can either walk or take a quick taxi ride to Embarcadero Nuevo Nativitas. Make sure you ask for this specific spot – this is where the main parking lot and boat launch is. There are tons of signs that will try to lead you from the station to a different entrance. There are people on bicycles touting for your business, but these smaller embarcaderos are much more expensive (and much quieter). Nuevo Nativitas has tons of food stalls and in my experience, it is one of the cheapest places to get a boat from. It’s where all the locals head, so it’s busy (in a good way). This is where the party starts. How Much Does a Trajinera Cost at Xochimilco? 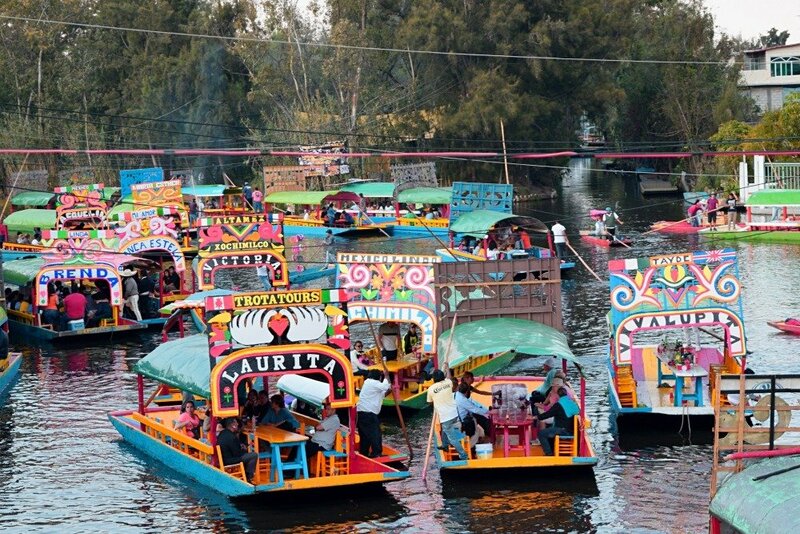 There are two types of boats in Xochimilco. Tons of signs that say 20 Pesos per person. This is for a TAXI boat. It will drop you off at a different location. If you’ve come to experience the canals, I don’t recommend taking this one. You can pay 40 pesos for a return trip, but it will simply go up and down the canal without any stops. The other option is to hire your own boat. These boats have tables and chairs (the other taxi boat only has benches). If you’ve come to Xochimilco to party with your pals, this is definitely the best option. You will pay 350 pesos (about $17) for one hour for the entire boat, regardless of how many people are on the boat. So the more people you bring, the cheaper is will be. We stayed on the boat for two hours (it went by SO quickly) and we paid 600 pesos. That was for four of us to ride up and around the canals for two whole hours. What Can I Bring on a Trajinera at Xochimilco? Bring everything. Bring waters, bring beers, bring bottles of wine, bring snacks, pack a whole damn cooler full of goodies. I always thought that there were tons of vendors selling food from their boats, and there are, but it is WAY overpriced. Stop at one of the convenience stores along the way and pick up beers and snacks before you go on the boat. When you get to Nuevo Nativitas, you’ll be able to have a few beers and plenty of street food – tacos, gorditas, tlacoyos, quesadillas, for really cheap. 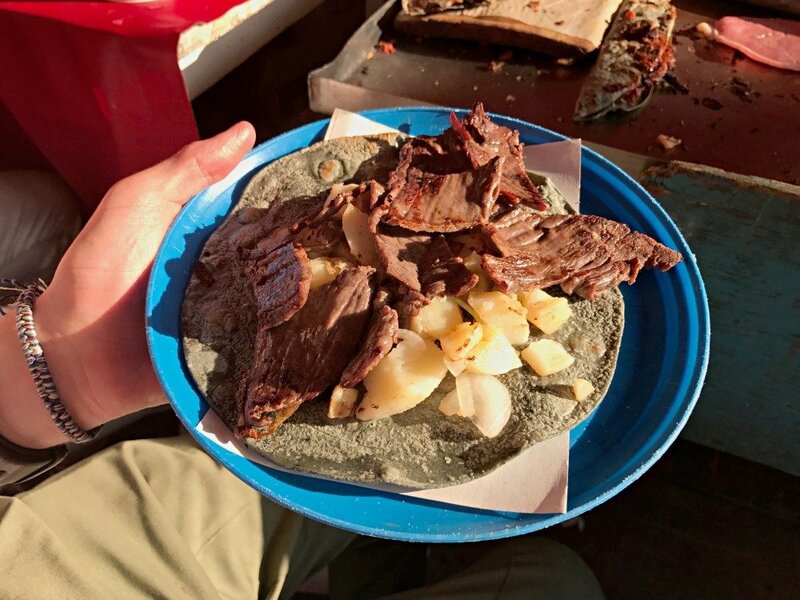 Definitely get yourself some cecina while you’re there (salted/dried beef in a taco). Definitely have the cecina tacos. They’re magical. What’s There to See and Do at Xochimilco? 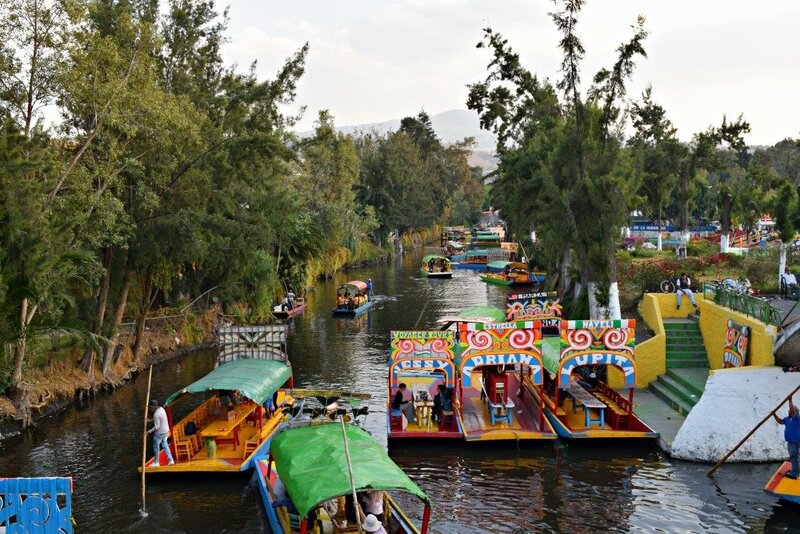 It’s all about the boat ride at Xochimilco. We went just before sunset and as you head down the narrow passages you’ll be surrounded by greenery. It feels miles away from the skyscrapers of downtown Mexico City. You can see the mountains and even a few stars after dark. There are tons of greenhouses around Xochimilco’s canals. You can ask the driver to stop and check out the different plants, and even buy one if you fancy it. 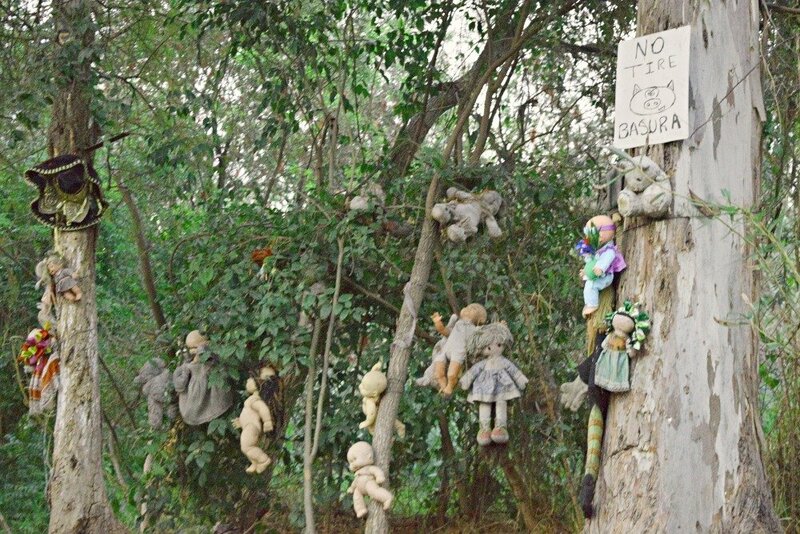 The other strange thing in Xochimilco is Isla de las Muñecas, or doll island. While the original doll island is a few hours away (you can go for about 1500 pesos), there is a replica doll island a few minutes from Nueva Nativitas. Legend has it that a young girl drowned in the canal near the island. The dolls are said to house her spirit and it’s become widely known as a haunted spot. 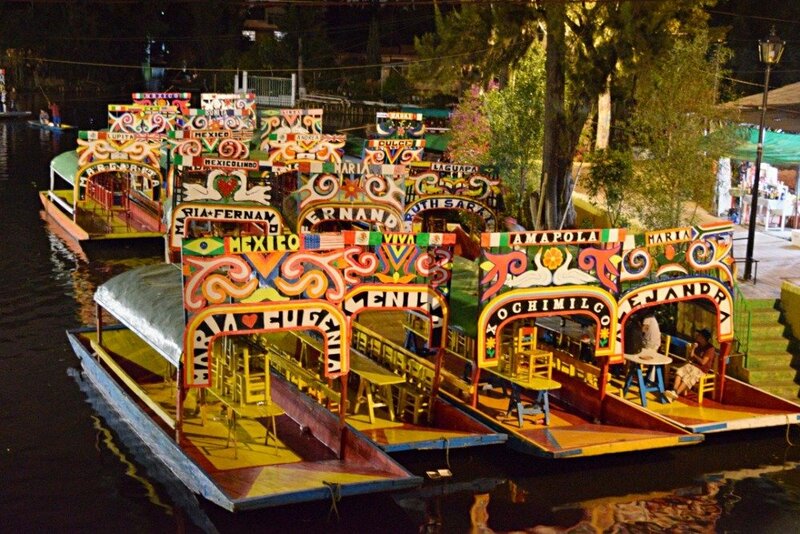 One of the best things to do is to simply enjoy riding past all the colorfully decorated trajineras (boats). Bring a speaker for your music (or you can rent one while you’re here) and say salud to all the people that pass by. Mariachi bands will come onto your boat as you move through the canals and serenade you with Mexican classics. Of course, you’ll have to pay for it, but it’s really fun and the guys have a great sense of humor. 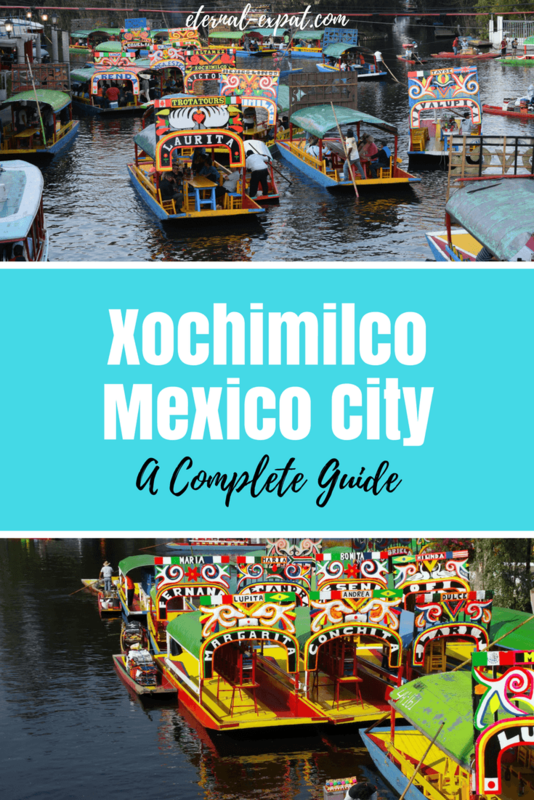 If you don’t feel totally comfortable navigating the metro and train systems, you can take a tour of Xochimilco from Mexico City. I’ve used Olympus Tours before when we went to Teotihuacan. They are excellent. So if you’re thinking of booking a tour instead of going it alone, I recommend checking them out. They’ll pick you up and drop you off at your hotel. They’ll arrange the boat and food. All you have to do is enjoy yourself. Have you ever been to Xochimilco? What did you think? « 20 Photos of Paris in Spring Because, Um, Paris. 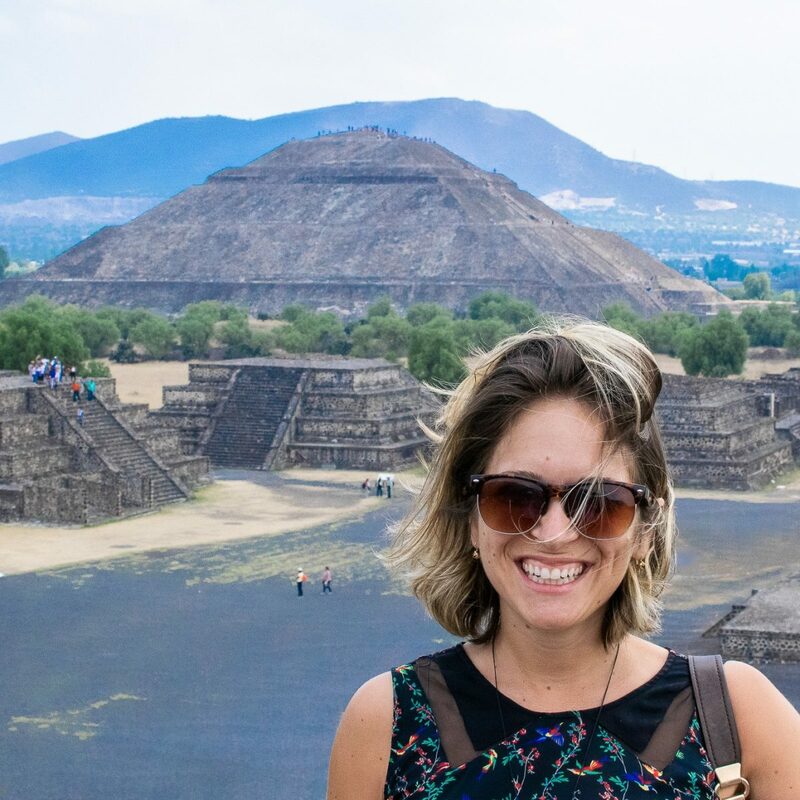 What do you recommend for women travelling alone to Mexico City? Should I attempt xochimilco alone (in hopes of meeting people to join forces) or go with a tour? I think it should be noted to do it during the day versus sunset. I was disappointed with the experience. First off the docks are empty and they aren’t that many people doing it as in the daytime. The only conductor that would take me just by myself and charged me 500 MEX for 1 hour but really seemed like half an hour. None of the food vendors and mariachi bands were part of the experience. Sure they were other boats navigating but it became too dark to see anything let alone the things in the tour like the fake doll island. Sorry, you didn’t enjoy your experience – it’s not the best if you’re going it alone unfortunately, it’s definitely something to do with a larger group. The weekends are really the best time to go if you want to experience a really busy place with lots of the mariachi bands and food vendors. Hopefully if you come back to Mexico City you can visit again with a group and see it on a busy Sunday afternoon.